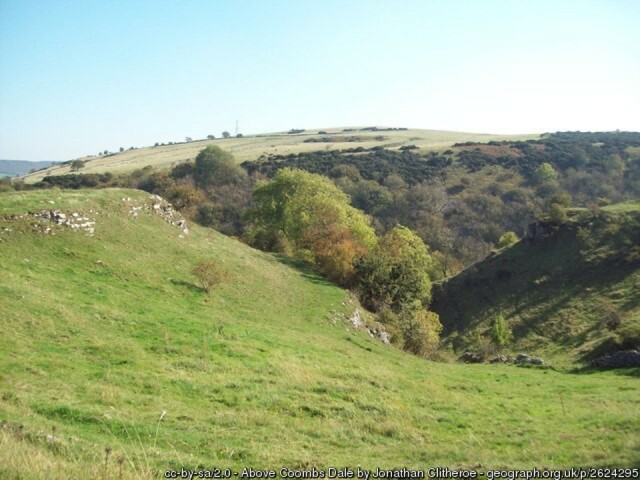 An interesting hike through one of the Peak District’s least known and most attractive dales, Coombs Dale; a site of special protection for its rare flora and fauna. Leading to Black Harry Lane named after the early 18th century highwayman who preyed upon travellers across these lonely moors. The Ghost of a Scottish peddler adds further to the intrigue of his hauntings of the local caves and local pub, as does that of a lover’s cliff top leap. 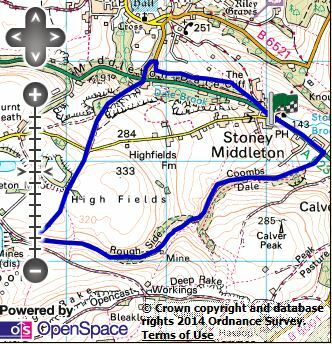 The walk is accompanied by a map which you can download below or why not watch the video of the walk below as well. The Moon Inn pub car park is a good place to park and start this walk – although remember to have at least a drink in the pub on your return as a thank you. From the car park, cross the road, turn right and head along the busy A623. After a couple of minutes, cross the road at the football pitch where you will see a public footpath running alongside. Head down the footpath. Soon, this path enters Coombs Dale – with trees lining both sides of the path. These trees eventually give way to small rock faces on the left and hills on the right. Just after the gate, turn right – heading north-east – and follow another public footpath. Here, the path climbs for the first real time on the walk. Although other paths lead off, stick with this one, as it passes signs warning about blasting and shooting (fortunately off the path of our walk). Carry on descending until the entrance to the quarry is on the right. Cross this entrance road with care, and carry on down the bridleway, making a trek towards the A623. On the right, around 600 foot from the road junction, is a footpath going past an Electricity Substation. 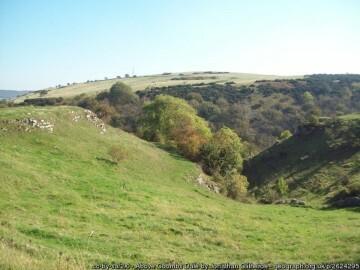 Follow this path and enter the most surprising part of this walk – a cliff-top trek across the top of Middleton Dale – with even high rock formations to the left. Take care along this path – it provides great views, and although it seems higher than it is, it is still quite a drop over the side. Heading back into Stoney Middleton passes “Lovers Leap” on the far side of the road. Carry on through the village, ready to enjoy that drink and possibly a wholesome meal, at The Moon Inn.